Think voice controls in your car or phone reduce distracted driving? Think again. We have to keep our hands, eyes AND minds engaged while driving, as it turns out. When we take those three factors into consideration, it would seem that ALL of us, at one time or another, have been guilty of distracted driving. Most likely all of us are guilty of eating while driving (manual), checking our radio or iPhone to change our music (visual) and just allowing our minds to wander away from the task at hand (cognitive). Unfortunately, most of us are probably guilty of texting while driving, which is the worst distraction because it involves all three types. Teens are particularly vulnerable to this distraction. 27% of drivers age 16 to 65 report using Facebook, and 14% report using Twitter. Of those, a startling 30% said they post to Twitter while driving all the time. Frighteningly, texting and driving has now surpassed drunk driving as the greater threat to drivers on the road according to the NHTSA. In fact, when the popular Mythbusters television show tested whether drunk driving or distracted driving was more dangerous, they confirmed lower road test scores by distracted drivers versus drunk drivers. 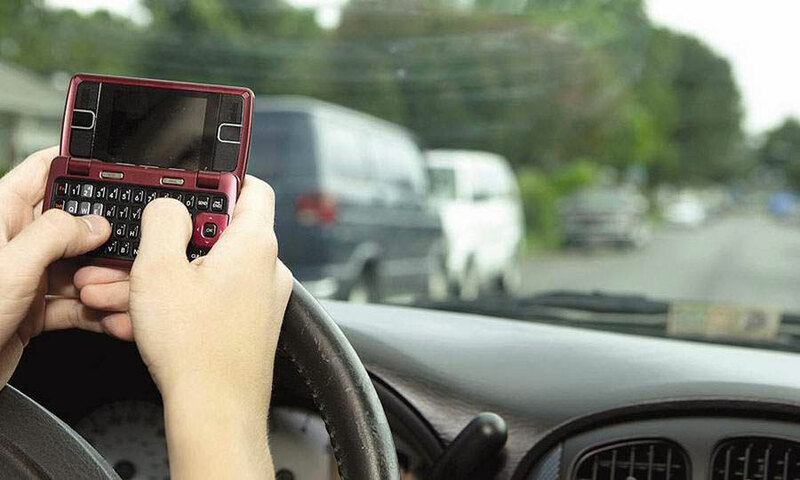 Do voice controls reduce distracted driving? In attempts to reduce distracted driving, many auto makers have introduced voice controls for their vehicles to ensure that drivers are keeping their eyes on the road. Despite studies by speech recognition vendors claiming that voice controls reduce distractions, independent studies by AAA have shown that attempts to get most speech recognition systems to understand your command while driving can be more frustrating and distracting than simply performing the action yourself: “Talking to your dashboard, or Apple Inc.’s Siri system, can be a stressful and potentially hazardous activity when conducted at highway speeds,” reports the Wall Street Journal. The solution is to improve speech recognition systems so that that frustration doesn’t occur. AAA reports that “developers can improve the safety of their products by making them less complicated, more accurate and generally easier to use,” something that Spoken has already done for enterprise clients with its no-repeat Spoken Smart IVR. Never dial while driving If you must dial manually, do so only when stopped or have a passenger dial for you. Take a message Let your voice mail pick up your calls while you’re driving. It’s easy—and much safer—to retrieve your messages later on. Know when to stop talking If you must make or receive a call while driving, keep conversations on brief so you can concentrate on your driving. If a long discussion is required or if the topic is stressful or emotional, end the conversation and continue it once you are off the road. Don’t take notes while driving If you need to write something down, use an audio recorder or pull off the road. Know where you’re going Study the route before you leave or have a passenger read the map. And if you’re using a navigation system, program in your destination before you start driving and use the audio setting to avoid having to look at the screen for directions. Don’t eat or drink while driving Eating takes both your hand off the wheel and your eyes off the road, so don’t do it. Furthermore, spills can easily cause an accident. If you have to stop short, you could also be severely burned. It’s extremely important that parents continually drill these safety principles into their teens. It’s important to remember that driving is a complex task and it only takes about two seconds for what seems like a minor distraction to become a major accident. Even if an accident doesn’t cause serious injuries, (thankfully) the damage done to one’s car, the hassle of dealing with insurance and the inconvenience of getting the vehicle repaired add up to one MAJOR issue that could have been avoided by simply staying focused on the road.